Why get your Projects “Printed in Wyoming”? Printing locally is a better option for you and your business than going to an out of state printer or to a quick copy shop. Because MSL is a small, personal and local business, we offer higher quality, customization, individual service and flexibility to you and your jobs at very competitive prices. This is not something you can or will get from a large, out of state, printing plant. As local printers we are able contact you if something looks incorrect on a first run, and you can come in to our shop and look at the print if necessary and make changes if needed before the printing occurs, saving you time, money and hassle. You can also come in to our shop to see an actual press run piece (Press Proofing) on large or complex printing projects so you can be sure your printed piece will look exactly as you intend before the pieces are printed in quantity. 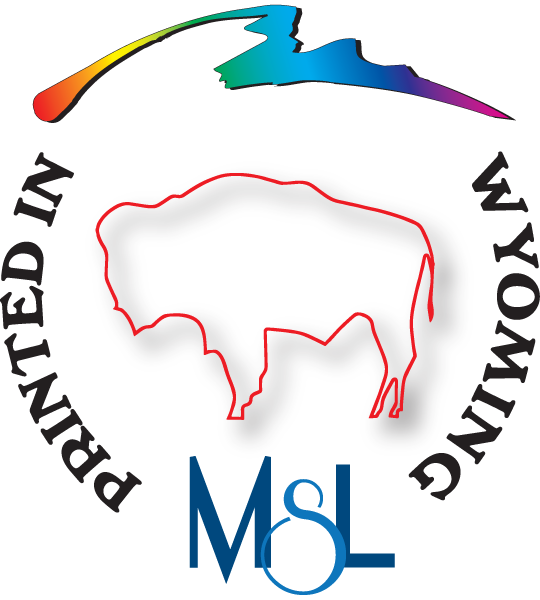 Mountain States Lithographing “MSL” is centrally located in the state for fast inexpensive shipping in the region and with our free delivery in Casper, Glenrock and Douglas, and will drop your printing right at your front desk. When using a local printer like Mountain States Lithographing your dollars stay local and employ your friends and neighbors. Offset Lithographic Printing and Digital Printing, PROS and CONS of each. Every printing project is different and designers need to take into account, how quickly the job is needed, the quality requirements, quantity needed and their budget when considering digital and traditional offset lithography. We will help select the right method for you based on the project, but use the following checklist to help you decide which may be best for your project. Both printing systems have their pros and cons which you need to consider before making your final decision. Cheaper low volume printing. Modern commercial digital printers are fast and are an inexpensive option for short run printing jobs, usually 500 or fewer pieces. 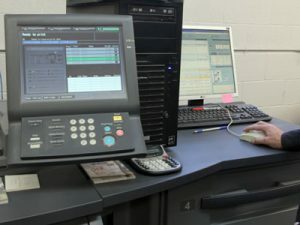 Digital presses can run a job as soon as the art is ready, with no delays to make printing plates and ink-up a large offset press, so the turnaround can be very quick. While the cost of each piece may be higher than with offset printing, when setup costs are included digital printing provides lower per unit costs for very small print runs. Digital printing is ideal for projects that are needed quickly with quantities as low as a single sheet. Variable Data Printing is a form of customisable digital printing. Using information from a database or external file, text and graphics can be changed on each printed piece without stopping or slowing down the press. For example, personalised letters can be printed with a different name and address on each letter. Variable data printing is used primarily for direct marketing, customer relationship development, advertising, and fund raising. Digital presses are also perfect for printed pieces that need to be changed or updated frequently. Mountain States Lithographing can provide these services and will advise you if our digital printers are the right choice for your project. Digital printers are constantly and quickly improving, despite this they still can’t match offset printing presses when it comes to flexibility. Digital printers are limited to a narrow array of papers and colors. Where an offset press can use the Pantone Color Matching System and inks to deliver unparalleled color accuracy. Digital printers use a fixed four color printing process and a matching process to simulate colors, which cannot quite match the accurate colors of traditional offset printing. A digital printers inks are not absorbed into the printing paper fully, this means that cracks can appear in the color near edges that are folded in the finished publication. This is not a problem in traditional offset printing. It’s also important to remember that traditional offset printing can be more cost effective than digital printing for higher volume print runs as the individual unit price comes down. Considering the superior quality of traditional offset printing, a traditional offset printer is a better choice for higher volume print runs than a digital printer. For the highest quality printed pieces, lithographic offset presses are the best choice by a large margin. Modern technology has developed to the point of computer-to-plate systems that deliver very high accuracy and quality at a reasonable cost. Offset printing presses offer more choice when it comes to print materials. Many graphic design projects require unique paper types and sizes, specialized inks and finishes, such as metallic inks, specific colors and varnishes. If your project demands the best quality or unique paper then the offset press is likely the best choice. With the combination of the Pantone Matching System and Pantone inks makes traditional offset presses the best choice when complete control is needed and color accuracy is required. The four color process used for digital printing simply cannot compete with traditional offset printing presses. If your project requires a high volume, traditional offset printing is not only more cost effective but can be quicker. Much of the time and cost associated with traditional offset printing is due to the preparation and press set up, however, if you have a high volume print run the unit costs are drastically reduced, once the set up is complete the pieces are relatively cheap to print. So what are the drawbacks of offset printing? It is not possible, or costly to change the print jobs during the print run since the press setup has to be changed or redone. This can be very time consuming, particularly when compared to digital printing, which is why digital printers are the best option for print jobs requiring a lot of customization within a short time frame. Traditional lithographic offset printing is more costly for low volume print runs This is due to the time it takes to setup an offset press and the cost of the printing plates, this raises the price per piece for short print runs. Digital printers are the best choice for quick and low cost short run printing. In summary, the choice of commercial printing processes will depend on your quality, needed options and volume as well as your budget and time schedule. Contact one of the printing experts at Mountain States Lithographing with your individual requirements for solid, professional advice. In order to better understand the four color printing process we must first discuss the color theory that makes it possible. 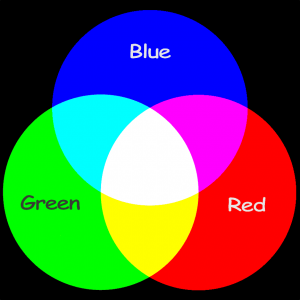 Color theory is broken down into two distinct areas, additive and subtractive. Both are vital to portraying color photographs in different ways, Our Main area of interest is in additive color theory since this is the vehicle that brings us to four color offset printing. When printing “process” color we begin with a white substrate and add color ink in order to give the illusion of a photograph or any color on that substrate. 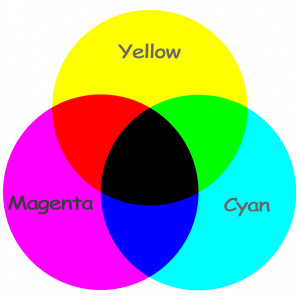 The primary colors in the subtractive color pallet are Cyan, Magenta and Yellow, Black is added called “K” so as to not confuse it with Blue. The addition of black ink is necessary so less of the other 3 colors can be used on the press and to give the image a cleaner crisper black and add more detail to the shadow areas. The color wheel on the left represents the relationship between the additive colors, demonstrating how the primary colors interact to form the additive primary colors, and where all 3 colors intersect black is formed. This shows the important relationship between the two pallets and the wavelengths of the light that they represent since the printing plate for each primary color is filtered through its opposite color to isolate the needed color, for instance a blue filter completely blocks yellow light, a red filter blocks cyan and green stops the magenta light wavelength. The additive color pallet starts with black as a base, or to be more precise, no light at all. The colors are projected or, as with an LCD Monitor, colored diodes are turned on in varying intensities to create the full spectrum of colors. With equal intensities of all three colors the result is neutral or white depending on the perception of the viewer. The following graphic is an example of the four color process, with which it is possible to reproduce all the colors of the rainbow using only 3 ink colors and Black. Since a printing press can only print inks in an all or none fashion (either 100% ink or no ink at all) it is necessary to convert the colors into halftones prior to printing. 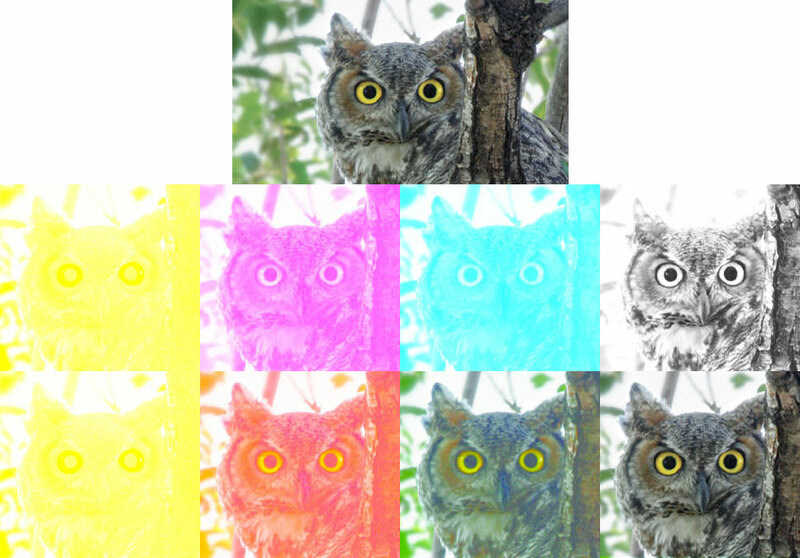 Here is an example of the owl printed then enlarged to show the halftone dots that create the illusion of a photograph. The rosette pattern of the dots is intentionally created by carefully angling the screens at 45, 75, 15 and 0 degrees to eliminate more annoying moiré patterns that will occur if the screens are improperly angled. Other screen angles are also used as per the press operator or graphic artists discretion. At Mountain States Lithographing we have the best presses, pressmen and graphic arts personal to achieve the quality you need and expect for your full color printing needs.